A 17-year-old student is in custody, suspected of using a shotgun and revolver to kill 10 people and injure 13 others inside a south Texas high school Friday morning in what Gov. Greg Abbott called "one of the most heinous attacks that we've ever seen in the history of Texas schools." 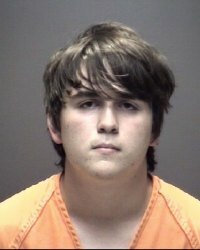 The suspected shooter, who was in custody on murder charges, also had explosive devices that were found in the school and nearby, Abbott said. Though officials later said the devices were not capable of detonating. "It's impossible to describe the magnitude of the evil of someone who would attack innocent children in a school, a place of learning where a parent should be able to send their children without fear for their child's safety," Abbott said. On Saturday, the Galveston County medical examiner's office and sheriff's office released the names of the victims who died: Glenda Perkins; Cynthia Tisdale; Kimberly Vaughan; Shana Fisher; Angelique Ramirez; Christian Riley Garcia; Jared Black; Sabika Sheikh; Christopher Jake Stone; and Aaron Kyle McLeod. Investigators offered no immediate motive for the shooting. The governor said the assailant intended to kill himself but gave up and told police that he did not have the courage to take his own life. The deaths were all but certain to re-ignite the national debate over gun regulations, coming just three months after the Parkland, Florida, attack that killed 17 people at Marjory Stoneman Douglas High School. One of the injured in Friday's shooting was school resource officer John Barnes, who was shot in the arm when he engaged the gunman. Doctors said Barnes was in stable condition Friday afternoon but later updated that he was in critical condition. From 1991 to 1993, Barnes worked in Fort Worth as a jailer and deputy with the Tarrant County Sheriff's Department. After that, he spent 23 years with the Houston police before starting with the Santa Fe ISD four months ago. Authorities had initially said 10 were injured in the attack but raised the number to 13 on Saturday. The suspected shooter is Dimitrios Pagourtzis, 17, a student at the school who acquaintances described as quiet and unassuming and an avid video game player. People said he routinely wore a black trench coat and black boots to school. Pagourtzis made his initial court appearance Friday evening via closed circuit video from the Galveston County Jail. He did not enter a plea. The judge denied bond and also took Pagourtzis' application for a court-appointed attorney. In the aftermath, officials found several low-tech explosive devices both on and off campus that were being rendered harmless by bomb technicians. Galveston County Judge Mark Henry said Saturday that authorities found a group of carbon dioxide canisters taped together, and a pressure cooker with an alarm clock and nails inside. But he says the canisters had no detonation device and the pressure cooker had no explosive material. According to a probable cause affidavit, Pagourtzis told investigators that when he opened fire at Santa Fe High School on Friday morning, "he did not shoot students he did like so he could have his story told." Students at the school, which is located about 30 miles southeast of Houston, said they heard a fire alarm at about 7:30 a.m. and thought they were taking part in a fire drill. Teachers told them to run when they started hearing gunshots. Abbott said the shooter used two weapons in the attack, a shotgun and a .38 revolver, and intended to kill himself after the attack but gave himself up and told authorities that he didn't have the courage to take his own life. The guns, Abbott said, legally belonged to the teen's father. It's not clear if the father knew his son had taken possession of the weapons. Abbott added, unlike the recent mass shootings in Sutherland Springs and Parkland, Florida, there were no red flags or warnings regarding the gunman. Pagourtzis, according to the Associated Press, was a member of the school's junior varsity football team and a member of a dance squad with a local Greek Orthodox church. A woman who answered the phone at a number associated with the Pagourtzis family declined to speak with the AP. "Give us our time right now, thank you," she said. President Donald Trump has "activated" his gun safety commission and is expected to meet with members next week, White House spokeswoman Sarah Huckabee Sanders said. The commission the president convened after the Parkland, Florida, shooting in February "has been activated today to start that conversation up again," Sanders said. She said she believes it will be meeting again in "first part of next week." She declined to say whether Trump will revisit some gun control measures after another school shooting, but added, "Certainly conversation's ongoing about the best ways to protect kids across the country." Trump tweeted earlier Friday about the shooting, saying, "Early reports not looking good. God bless all!" First lady Melania Trump tweeted that her heart goes out to Santa Fe and Texas. Students described the horrific scene that unfolded at the school. Dakota Shrader told NBC affiliate KPRC that students started leaving their classrooms when they heard what sounded like a fire alarm, but soon teachers were telling them to run. She and a friend ran into the forest. "Nobody knew what to do, all we did was run. There was nothing we could do but run," she said. A friend of hers was shot in the leg but is recovering in the hospital, Schrader said. She was upset and said she didn't feel safe in school or the town anymore. "Whoever did this is really selfish and cold-hearted. These are innocent people at this school. We did nothing to deserve this." Angelica Martinez, a ninth-grade student, said it seemed like it was a fire drill at first. "It was a fire drill, so we followed the procedures ... we didn't know it was an intruder," she said on MSNBC, adding she would probably have hidden if she knew it had been an intruder. 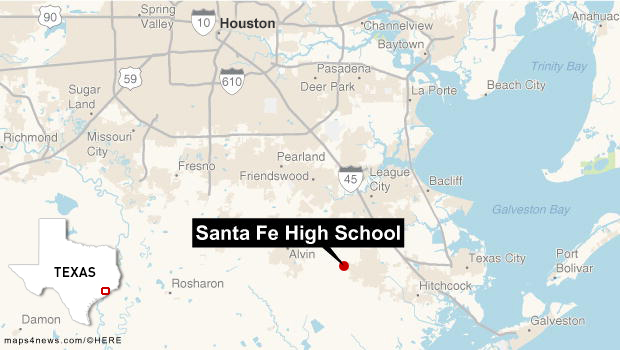 Police are responding to an active shooter situation at Santa Fe High School in Texas. Authorities say one shooter has been arrested. Her mother, Angie Martinez, said she was on the phone with Angelica during the incident, telling her to run to a nearby gas station or find a hiding place. "I thank God that a guardian angel was protecting her or something because she made it out alive," Martinez sad. Gov. Abbott promised he would take swift action to bring an end to mass shootings in Texas. "We need to do more than just pray for the victims and their families. It's time, in Texas, that we take action and step up and make sure that this tragedy is never repeated, ever again, in the state of Texas," said Abbott. The governor said to do that he would work with the state legislature and meet with Texans across the state to develop solutions to prevent school shootings and keep communities safe while also protecting 2nd Amendment rights. Texas Lt. Gov. Dan Patrick and U.S. Sen. Ted Cruz appeared with the governor Friday. Patrick said Texas schools need to be hardened against attacks and may need to be remodeled to offer fewer points of entry, protecting them in the way that office buildings are protected. Cruz then praised the "bravery" and "courage" of "officers, teachers and students" facing another example of violence in school hallways. "There's been too damn many of these," said Cruz. "We will make it through this. Once again, Texas has seen the face of evil." Friday's shooting is the nation's deadliest school shooting since the February attack in Parkland, Florida, that killed 17 people and re-energized the gun-control movement after surviving teens launched a campaign for reform. 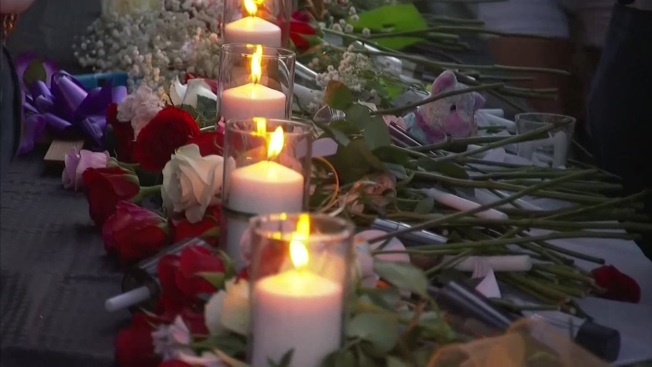 A vigil was held Friday evening at Texas First Bank on Highway 6, where students and teachers were invited to join members of the Santa Fe community in remembering the victims of the shooting. The Houston Texans confirmed to NBC News early Saturday that football player JJ Watt will pay for the funerals of all 10 victims. 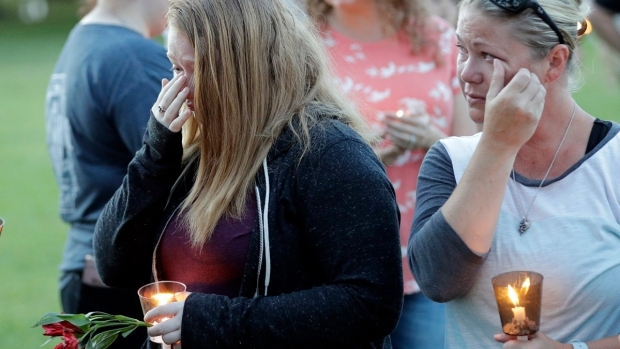 Friday's assault is the deadliest in Texas since a man with a semi-automatic rifle attacked a church in Sutherland Springs, near San Antonio, late last year, killing more than two dozen people.